The Sea holly (Eryngium maritimum) is a species of Eryngium in the plant family Apiaceae and native to most European coastlines. It resembles a plume thistle in that its flower is burr-shaped, but the flowers are metallic blue rather than mauve. Protected from winds this dune plant grows to a height of 20 to 60 cm. 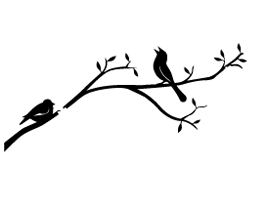 Although widespread, it is considered endangered in many areas, such as Germany where its occurrence has been greatly reduced throughout and has become locally extinct in several districts. Looking for a fascinating addition to the garden? 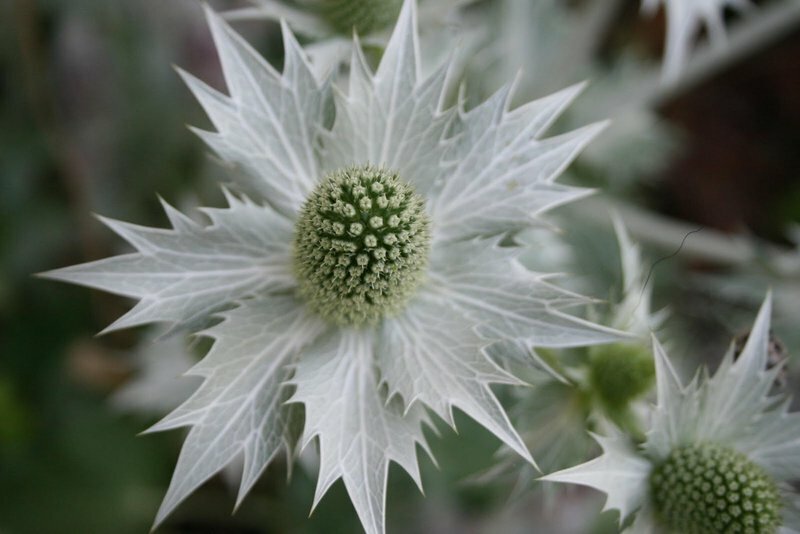 Then why not consider growing sea holly flowers (Eryngium). Sea hollies can provide unique interest with their spiny-toothed leaves and clusters of teasel-like blossoms. They also offer versatility with their wide range of growing conditions and various uses in the garden. Eryngium plants, also known as sea holly flowers, make striking additions to the garden. Mostly native to Europe and the Mediterranean, these plants generally grow anywhere from 18 to 36 inches tall with a one-foot spread. Their green or silvery-blue stems give way to green or blue cones surrounded by spiky silver, white, green, blue or violet bracts, which bloom from summer throughout fall. 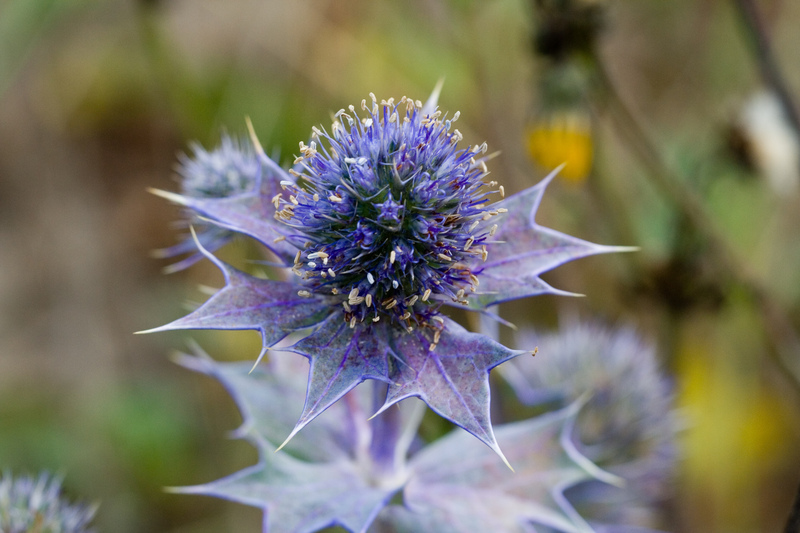 Sea holly plants are tolerant of drought, winds, salt sprays and sandy soils. They can be used as specimen plantings, in beds and borders, or butterfly gardens. In addition, these plants make excellent dried flowers. 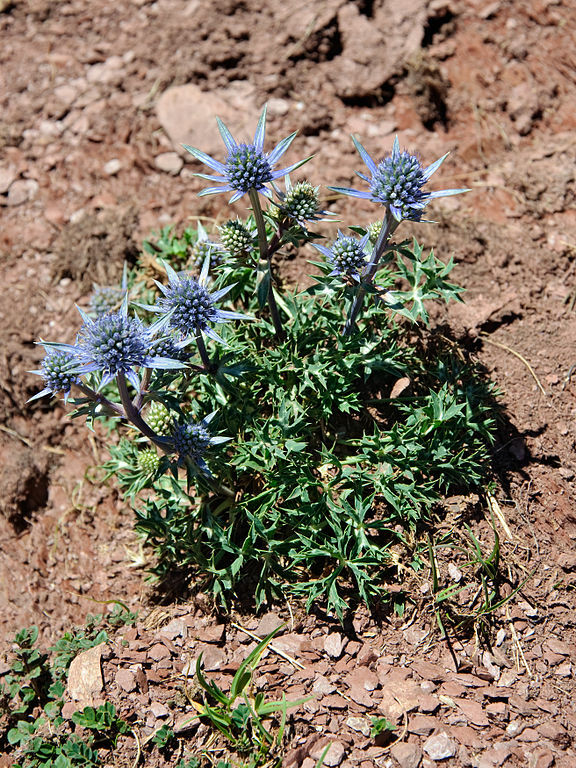 Alpine Sea Holly (E. alpinum) – Native to alpine pastures of Switzerland, both the flowers and stems of this species are considered the bluest of the genus. Growing about 2 feet high, you’ll find this one at its peak during July and August. Amethyst Sea Holly (E. amethystinum) – Growing 1-1½ feet tall, this European native is one of the most cold hardy of the genus. It has beautiful amethyst blue flowers and a somewhat straggling nature. Mediterranean Sea Holly (E. bourgatii) – Native to Pyrenees, this variety reaches 1-2 feet and consists of lively blue-green flowers with silver bracts and white veins within its coarse, spiny leaves. Giant Sea Holly (E. giganteum) – Also known as Miss Wilmot’s Ghost (named for English gardener Ellen Wilmot), this Caucasus native makes an excellent plant for grouping in a background, growing from 3 to 4 feet or higher. While it may require staking, its heart-shaped leaves and large flowers are worth the extra effort. Flat Sea Holly (E. planum) – Another plant with heart-shaped basal leaves, this native to Eastern Europe grows 2-3 feet tall and produces numerous silver-blue flower heads. Rattlesnake Master (E. yuccifolium) – A native to the eastern U.S. with creamy chartreuse, button-like flowers and strap-like leaves, this species reaches 2-4 feet tall. Its name is said to derive from the myth that these plants could cure rattlesnake bites or drive them away. Common Sea Holly (E. maritimum) – This plant is one of the smallest, growing from 6 inches to 1 1/2 feet high. Growing Eryngium plants is easy. All types will thrive in full sun and moist soil with good drainage. In fact, they actually prefer sandy soil. The long taproot, however, allows the plant to tolerate poor soil conditions and drought. Because of their taproot, locate sea hollies somewhere permanent, as they do not transplant easy. Place young plants in holes that are a few inches wider and deeper than their current root system. Seeds can be sown directly in the garden, though they may not bloom the first year. The seeds require a warm moist stratification for one month followed by one month of cold moist stratification. These plants are relatively care-free once established. 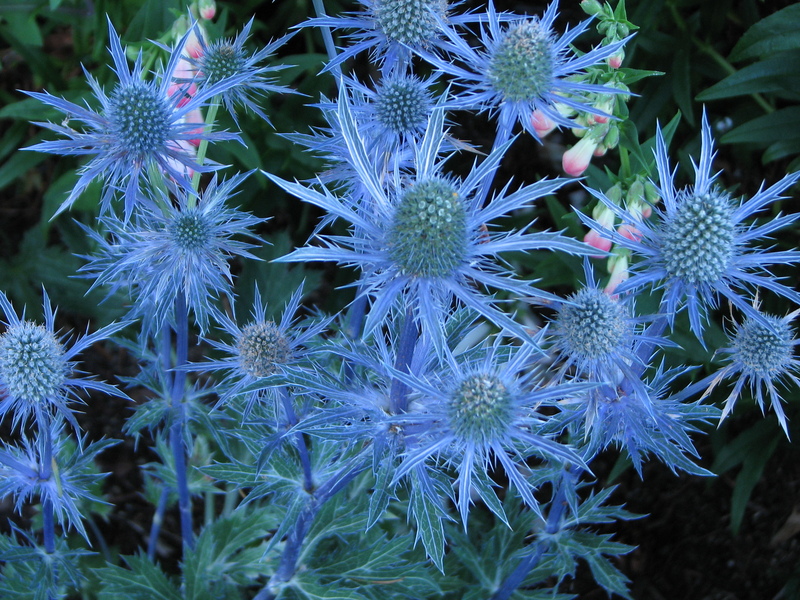 Sea holly flowers do not require much in the way of watering except during long droughts. It’s not necessary to fertilize sea holly either. Refraining from fertilization will keep the plants more compact and less droopy. Deadheading should be part of your sea holly plant care. Pinch or cut off spent flowers to encourage additional blooming. You may also cut off the flower stems once its blooming period ends in autumn, but allow the evergreen leaves to remain. 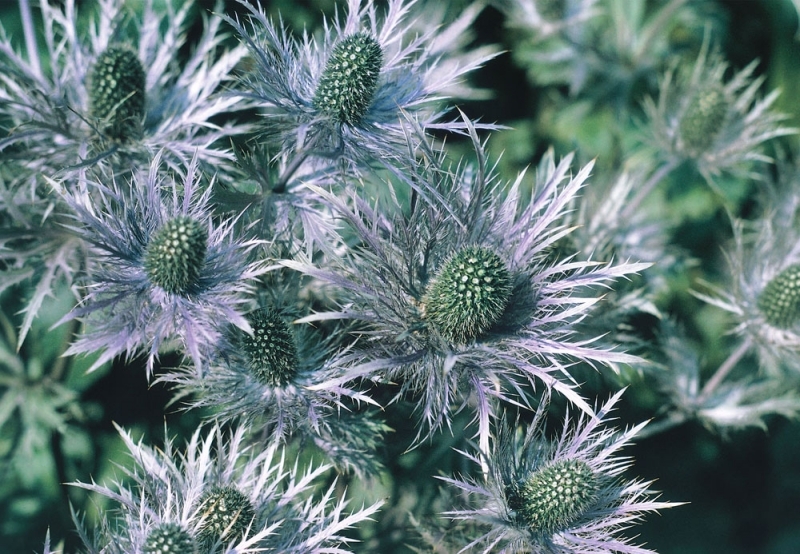 Now that you know how to grow a sea holly, why not give this plant a try. It’s a great plant for difficult situations and ideal for attracting butterflies. As a bonus, when planted around your garden’s perimeter, it will help deter deer. 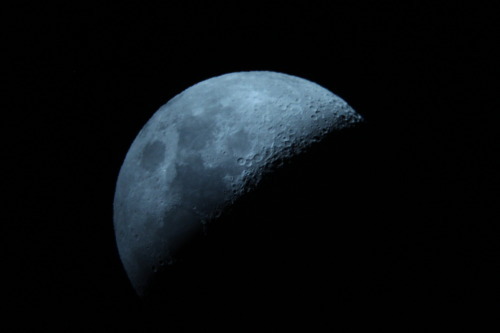 This entry was posted on June 26, 2013 by carinaragno. It was filed under flowers, gardening general info, plant care guides, planting your garden/crops, selecting a site, small tips, starting a garden, taking care of your garden and was tagged with cat deterrent, deer deterrent, easy growers, Eryngium maritimum, flowers, how to, perennials, plant care guide, sea holly.